Originally published under the title "59 Tomahawk Cruise Missiles Dropped on Syria." 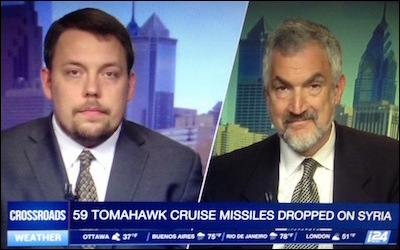 MEF Director Gregg Roman (left) and MEF President Daniel Pipes offer opposing views on last week's U.S. missile strike in Syria. Director Gregg Roman and President of the Middle East Forum Dan Pipes. Gentlemen, thank you being with us. And Gregg, I'll start with you. Was dropping those 59 Tomahawk cruise missiles on Syria the right move? Gregg Roman: I believe it was. It did three things. First, it was a message to the Assad regime that the use of unconventional weapons, as Barack Obama promised ... , will not be tolerated by the United States and its allies. It reestablished, in my mind, U.S. deterrence vis-à-vis not just the Syrian regime, but also its partners in Hezbollah and Iran. And it delivered a shot across the bow to Russian assets in Syria. The second thing that it did was it sent a message not just to Russia, Iran, and Syria, but also to those on the ground, that the U.S. will intervene when it chooses to [and will] define its own policy objectives. And I think this will bring us closer to those [warring] sides agreeing to a political resolution. And the third thing that it did was send a message to other U.S. nemeses, not just in the Middle East, but also throughout the rest of the world, that the U.S. is willing to use force when its enemies cross lines [or do] something that is intolerable for its national security priorities. And Dan Pipes, let's bring you in. Do you agree? Was this the right move and what message does it send? Daniel Pipes: Well, the Middle East Forum is a place where debate is welcome, particularly over tactics, and Gregg and I disagree. I wrote a piece last night titled 'No to Bombing Syria' and I'm against it because, in the first place, it's an arbitrary distinction between the chlorine attacks that have been taking place on a regular basis and sarin attacks. Why is this one so much worse than the others? Why are we suddenly getting upset over this and not over the many, many Syrian government attacks on its own population? Secondly, it's symbolic, and unless a great deal follows, which I don't think is going to happen, this will be seen as something that the Assad regime has been able to survive. "Symbolism is not a good idea in warfare." Thirdly, it's not part of any plan. From all that we understand, President Trump saw pictures of injured or dying children and got emotional and decided to attack. That's not the way to conduct a war. And finally, there is no support, I think it's fair to say, in the United States for an extensive military campaign in Syria. We've just gone through that in Afghanistan and Iraq. American people are not ready for this, so it's really a paper tiger. It's symbolic and symbolism is not a good idea in warfare. If you're not ready to put troops on the ground, don't even start it. ... [G]oing to the third point you made, there really isn't a plan now. Is that something that Middle East Forum will now talk about and start presenting options for? Because it seems like it's time. Pipes: Absolutely. First, we've been consumed with the rights and wrongs of what happened yesterday, or early this morning Middle East time. Secondly, we are now looking to figure out what next and the basic question is, "Is this a one off attack? Should it be left right here, or is this the beginning of something larger?" I think it was a mistake, and it should be left behind us as a mistake. And I think US policy should be to stay away, to help those who are suffering, and to help those who are losing, but indirectly. I don't think we have any – we don't have a dog in this fight. Yes, the Kurds are pretty good, but they're not in contention for control of the whole of Syria. What we have is essentially the Sunni jihadis versus the Shia jihadis, the Turkish- and Saudi- and Qatari-backed to one side, and the Russian- and Iranian-backed to the other side. Both of them are horrible. Both of them are repugnant. So I think we should not get involved in helping either side. We should simply help either side not lose because we don't want the other side to win.